DABAWALAS: Lessons for building lasting success based on values by Shrinivas Pandit (Tata McGraw-Hill Publishing Co Ltd, New Delhi, 2007) p 105. This book is unique in its approach, convincing in its delivery and interesting in its style. 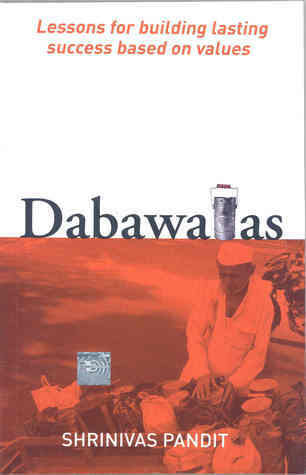 A true testimony of the values that bind Dabawalas for more than 120 years by Shrinivas Pandit. The author follows a narrative in an interview form through the team of four - two dabawallas (Raghunath Megde, 48 and Gangaram Talekar, 55), one business journalist (Anita Dalal, 40) and he himself. The book is divided in 12 chapters and every chapter is closed with one message and take aways (current practice and current opportunity). It makes a good case of Dabawalas for anyone who is interested to know their functioning, operations, supply-chain, value system, priorities, adaptiveness to change, structure, empowerment, decision-making, team-work, commitment, service quality, total quality management processes, standardization, contentment, etc etc. Though the book is small in size (just 100 pages) but the message it conveys is huge in size. There are very many examples which established multi-national corporations and big corporate houses could follow. It reminds me of a saying which says that if one has an attitude to learn, one could even learn a lot from beggars and poor people living in the society. Mind it, Dabawalas are not small in size, there are around 5000 (semi-literate) of them, working on a simple mission of delivering home-made food to the people (in Mumbai) from their respective houses to the workplaces within 3 hours. And this mission helps them earn their living which is not at all commensurate with the kind of efforts they put in order to reach out to more than 2 lac clients. Interestingly as the book reveals, there seems to be no issue on that as well. They are quite satisfied and contended with around Rs 200/300 which they charge per person, per month. Dabawalas are the perfect example of best quality service with six sigma performance as their error rate is one in 16 million transactions...despite having no technological backup and their turnover is around 500 million indian rupees. Every dabawala is a shareholder in Nutan Mumbai Tiffin Box Suppliers Charity Trust. Every one wears a Gandhi cap during working hours and carry an identity card and no alcohal during duty hours is allowed. Unlike many successful MNCs and other organizations this organization does not believe in internal competition as no dabawala is allowed to undercut or outsmart his colleague. They have a Governming council of 13 members having President, Vice President, General Secretary, Treasurer and nine directors. There are around 120 groups, each having some 25-30 dabawalas, which are led by a Mukadam (group leader). Each group works as a Strategic Business Unit The problems, complaints and grievances are initially resolved by Mukadam, however if they are not able to resolve issues it is taken up with the President or Vice President. If there are any disputes about the overall functioning they are resovled by the governing council. They follow competitive collaboration which drives them to deliver the daba (tiffin box) within stipulated time and the synergy in the efforts of individuals towards making the group as well as the chain effective is excellent. The cardinal principle is that the daba has got to be delivered on time, the race has to be won in three hours every day, no excuses. It is the sacred duty to ensure that the customer does not go without his home food. Team work is the quintessence of our success (p11). Hatachi pachuch bote hajaro kame kartal; karan tyanchyat aeekya aste (five fingers of a palm can do a thousand things becasue they have unity). They believe in leaderless teams, which seems to me as an experimental model of Engagement as the group depending on their abilities and capacities chooses a leader (Mukadam) who takes up this role as an additional responsiblity. The book successfully narrates the functioning, principles, values, and practices followed by dabawalas in a very simple language. Though it is a very traditional organisation which does not have technological exposure, it teaches very many lessons to the big corporate houses. Shrinivas Pandit and Anita deserve a kudos for this venture of theirs. Well done both of you. As I flip through the last pages and sentences, I end up with a feeling as if there is still much more to come and much more to be further learnt from these great individuals carrying dabas with full dedication and commitment to make sure none of their client goes without home made food. "the book is small in size (just 100 pages) but the message it conveys is huge"
Once a good piece of work.